I still remember that day, 23 years ago when we met first in front of a computer. We were both in our 20s and had tons of dreams and plans. I saw you and something inside me told me that you are the one for me. I am absolutely lucky and fortunate to have met you and to have traveled 20 wonderful years with you as your spouse. Right till the moment I laid eyes on you, I had a strong resolution that I was never ever going to get married in my life. The reason was simple, I have a physical challenge and our country and society are not kind to people who marry people like me. In fact, people like me rarely get married here. But then, you came along like a gentle and caring tsunami and changed all that for me. I only hope and pray that the other 19 plus million folks like me in our country stop underselling themselves and learn to live like you have taught me to. 1997 was not a year that was good for a tamil brahmin girl to marry a malayali boy of her choice and that too with a visible physical challenge. I remember the clear disappointment writ large on your parents face when they met me first. I also remember how you told them that it was you and not them that was going to live with me. 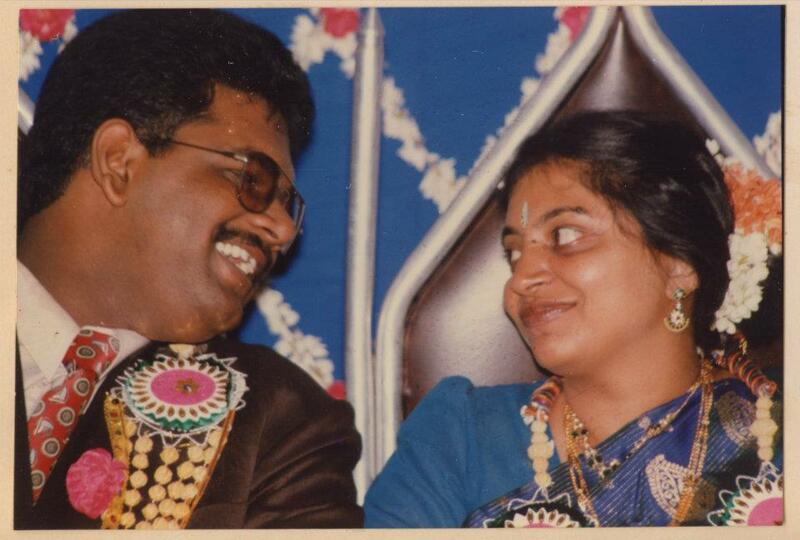 I have immense respect for both our parents who understood what we shared and became happy members of our family. The initial days of our marriage were a bit of an adjustment curve for you as the 24hr lifestyle with someone who has special needs can be quite a shock initially. But you never ever gave up on us, you loved me unconditionally and that alone can explain how we got through all the rough patches. Given the number and kind of questions and challenges that you have faced from that day till today, I feel proud that I have you with me. You are able to be an Iron Woman when needed and a gentle breeze when I am a bit low. I remember the many many times when people have looked at you and even openly asked you how you have a life and a kid with this guy who is disabled and every single time, you told them that I had more ability than all of them put together and that the notion of ability should not be based on physical prowess alone. You gave me the best possible thing that any man could ever dream of – complete family. You made me a father. In our son I see a bright young India that does not see my wheelchair but instead sees my capability and respects me as an individual. In him, you gave me another close friend. He has no qualms with who I am and looks at me like I am his hero. That is something that is rare and I cherish it everyday. I love the fact that our marriage has no roles or stereotypes associated with it, both of us do everything that we can and both of us are equal partners in everything. There are no molds of man and woman or roles of husband and wife. We are partners and above all, the best of friends till date. That makes this marriage fresh everyday and something that we look forward to every morning. Like all couples, we fight and sometimes very hard. But then, they are disagreements at best and never anything more than that. You are a university topper with brilliant grades and smarter than me by miles, yet you chose to support me in my endeavor to be a face in the crowd. The number of times that you have physically lifted me up (from my wheelchair) and emotionally lifted me up (whenever I hit a challenge) is testimonial to the fact that you are the strong one. I proudly tell everyone I meet that you are 95% of whatever I am today and I mean that from the bottom of my heart. I decided to give up a flourishing career in Networking and go freelance and build our living on something that no one had ever understood fully till then. You had a long chat with me and after you heard what I had to say and what my plan was, you have not even once turned around and questioned that decision till date. Today you literally take me to places on my wheelchair, we fly all over the world together. These are things that are unimaginable without you for me. You do all this, but you never put yourself in the limelight, you let me hog it. You are a perfect illustration of the fact that still waters run deep. You are the more knowledgeable one, the more mature one and the stronger one among us. You are US! I would go even one step further and say, you are me! I am immaterial and useless without you and your strength. These 20 years have been immensely amazing and I am now getting ready for the next 100. What is life with out you? It would be a pointless and meaninglessly long journey.Let’s do a 100 more! Looking forward to telling our grandkids our love story soon! At this point I would like to tell my friends with special needs that this notion that we are not entitled to a full life is very wrong and we all should live life to the fullest. Remember, you get only one shot at this thing. There is your version of Hema waiting for you, you just need to look over your shoulder after taking that chip off it to see her/him and start having a full life. Never sell yourself short, we are all human beings and not ascetics or sages. Coming back to my note, My Dear Wife, Let’s go for a century. You complete me and I am not able to see any version of a successful me without you.